UEFA Champions League: Philippe Coutinho ripped the back of the net with a stunner to seal Barcelona’s march to the semi-finals. Philippe Coutinho got his message across to his own club fans as he scored a spectacular goal against Manchester United in the Champions League quarter-final on Tuesday. 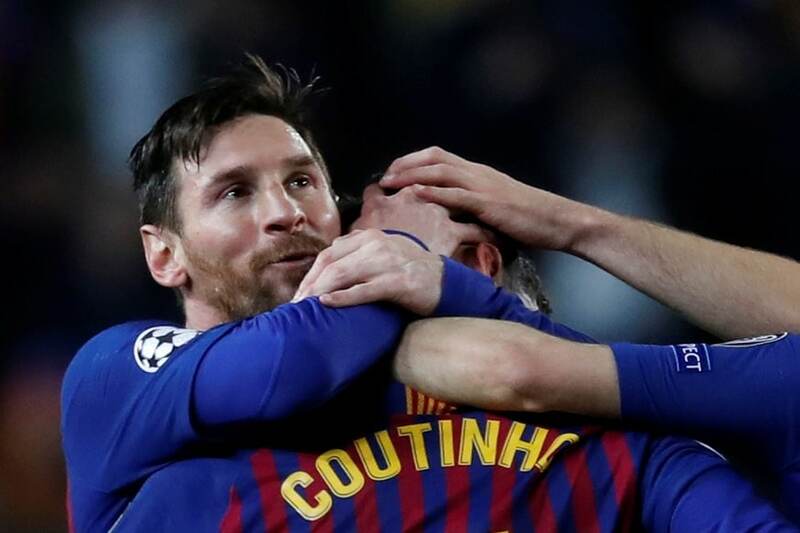 Barcelona were already cruising into the semi-finals, courtesy a brace from their main man Lionel Messi in the first half itself, but in the 61st minute, Coutinho turned up and how to leave his mark on the match. Messi made a brilliant pass to find Coutinho and the Brazilian turned around with the ball to get more towards the centre and then unleashed his trademark long-ranger from 30 yards out. Coutinho celebrated his goal by facing the stands and putting his fingers into his ears to block out noise. It was a clear message from Coutinho to Barcelona fans, who have not given him much support. He showed a glimpse of his immense talent on Tuesday and clearly asked the fans to stop complaining and support him to perform better. As he stood like that celebrating, his teammates came around him and shook him up and hugged him. The biggest of smiles and hugs came from Lionel Messi. Coutinho has not had the easiest of times at Barcelona since his transfer to Camp Nou from Liverpool last season. In his 48 appearances for the club, the Brazilian has scored just 13 goals and the fans are still waiting to see him fulfill his potential. In recent times, Coutinho has not had it easy with the fans who usually direct grumbles towards him. However, on Tuesday, he was given a standing ovation by the Camp Nou crowd when he was substituted. Recent transfer rumours have suggested that Coutinho might be keen to move away from Barcelona. Even though Manchester United held talks for a possible transfer, it is believed that Coutinho has rejected United as he does want to betray his Liverpool fans and also because he was booed at Old Trafford during the Champions League match last week.